Where best to see the race and how to get there from the start/finish area. One of the best points is at the roundabout where Derby Road crosses the Ringroad by Queens Hospital. (SK 545543 38880). This is where the loop around the university and wollaton park begins, so you see the runners at 3.9 and 9.2 miles of their course. Thus you can see the faster ones twice whilst the slowest are still arriving. From the start it is 2.5 miles, which is no problem if you are running or cycling, but may mean that you miss your runner finishing if you are walking. The route also follows the last mile of the half so you can see plenty of runners on the way back. Link (roll over me to see where I go) is the route, use it for return also. For walkers if you set off before the race then a good viewing point is near Nottingham Station or further on near the Castle. On the map below you join the runners at (on my map) 1 mile by the station or better see them when the go up the side of the Castle 1.36 miles and catch them again when they have come down at 1.44 miles. this is at about 1.5 and 2 miles on the course. which should give you glimpses of the leaders as you return. The key is the footbridge, now open again, which allows you to see the runners at about 24.4 miles and get back to the finish before them. 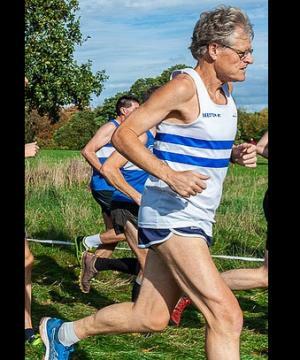 If you can walk quite fast or are running, then aim to go to Holme Pierrepont water centre and see them at 16.5 and 19.3 before returning by the riverside path to the footbridge and finish. By bike you can see them all over the place, but particularly at the Watersports centre where runners are most in need of support as it can be very tedious there. For the riverside path, cross the footbridge, go under Trent Bridge and follow the river downstream. At the water sports centre just cross over the grass, the map suggests one route, and go around by the boathouses to the main centre (bar, toilets, refreshments) and you go to the road to watch (end of map route) then return to the rowing course to see them twice more (within a short period of time) before returning by the river and hopefully beating them back to the footbridge. Please be aware of the runners behind you on the riverbank as the path is quite narrow. The route that i usually cycle for the second half of the marathon is to go up the riverpath and basically follow the marathon route backwards, that way you see most people.